Small sided football is an up and coming adaptation of full size football which is being played recreationally on new and existing MUGA or dual sport games area courts. This new and fast paced sport is played with fewer participants, smaller court dimensions / size, smaller goals and reduced game times. 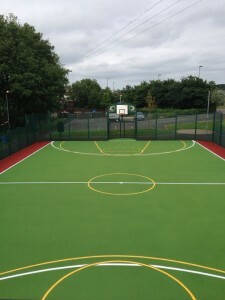 It is most commonly played in a contained MUGA with fencing and on surfaces like 3G / 4G astro turf or standard synthetic all weather non grass systems. As kickabout courts can be constructed, specified and designed to be made in almost any areas size, the system can be tailored to suit the area that you have. We are specialists in this sector and the company have built systems from 22m x 12m to 105m x 60m in areas such as local or national sports clubs, schools and parks for local authorities. There are also other types of dual sport surfacing which can be suitable for small sided football, these include Polymeric / Tartan surfaces and Porous Macadam. All of the surfaces can be made available for use by other sports at the same time and this is what makes the kickabout court so essential for these clients. 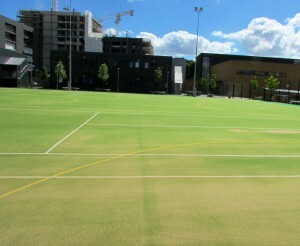 Netball, tennis, hockey and badminton are all sports that can be played and game line marked on the sports court at the same time. The lines are a different colour and sometimes a different width like 40mm / 50mm. Designs, funding advice, budget allocation, prices, costs and quotations are all services that we can help you with, along with any other help that you may need. Please contact us through the enquiry form or visit our website on https://www.sportsandsafetysurfaces.co.uk/ to find out more about any of the products and services that we currently offer.